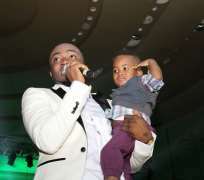 Ice Prince welcomed a baby boy last year with a 20-year old undergraduate student. Soon after she put to bed and the news went out, Ice Prince denied ever impregnating her, and said it to whoever cared to listen. He has however explained his reasons for doing that in this new interview with showbizplus, because he now flaunts the boy and also brought him on stage at his just concluded FOZ concert. It was complicated back then, I didn't really know what was happening and I wasn't sure of certain things. So the best I had to do then was denying it and sort out things first. Now I know he is my child and I have done everything as a father ever since. No, I'm fully focused on my music.